I was probably a panda in my previous life so there remains the strong love for bamboo shoots. Fresh or dried, pan-fried, salad or soup, no matter how it is prepared, as long as there is bamboo shoots in the menu, I will definitely give it a try. In Europe, when the supply was not that sufficient, I would use artichoke as substitute. 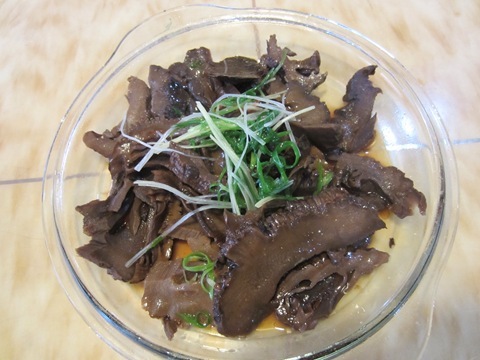 And this dish is definitely one of the top 3 bamboo shoot dishes in Shanghai. Soooooo happy to have it on my last day in Shanghai. Large bamboo shoots were smoke-dried first, then the chef amazingly brought back the juicy fleshy texture of fresh ones with unique smoke-dried bamboo flavor. The seasoning is minimum with light soya sauce and scallion oil as topping so the bamboo flavor can be 100% savored. The unique strong taste kept reminding me of truffle, except that each slice is of half-palm size! I was supposed to buy some tea snacks to bring to US. The shop I intended to go was close for lunch break. Somehow this cup in the neighboring shop caught my eyes. What can I say? Love at the first sight! 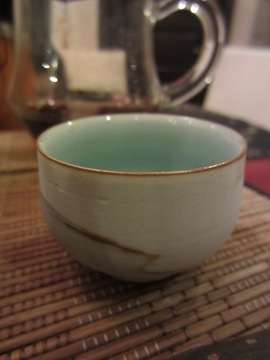 I ended up buying two cups from the same artist Ye Zheng Mao. Certainly the most expensive cups I have ever had – my philosophy has been that I only purchase things at a price range which I can use at ease without even a slightest worry of possibly damaging them. 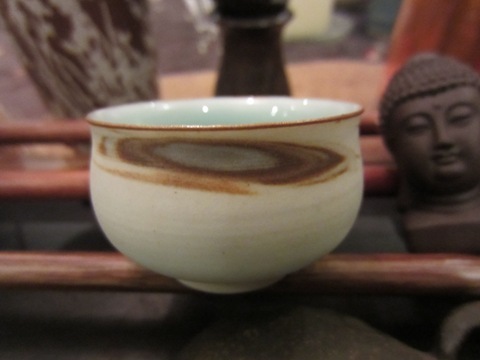 These patterns were not painted but made by blending different clays before burning so each cup is unique. The 2nd one I got even came out with this mesmerizing eye or galaxy sign.